Elementary, again, you must post a log from a session in which you experienced a crash. To generate this log, run the program, reproduce the crash you reported, then upload the log file after the crash. Yes, thanks. Try the suggestion in item #4 in the opening post. The same problem, crashes when i turn. You made the config file edit, and deleted the cache folder? Yes, i change the LoaderMode to 1, and delete the chache folder. That line was an example. Anyway, can you post a new log so I can see what happens when you crash now? The only thing I can think of is that you're using a Quadro. SpaceEngine seems to run incorrectly on workstation GPUs. SpaceEngineer will try to discover the cause of the problem and fix it if he can, but it's difficult for him since he doesn't have a Quadro to test with himself. Edit: I just talked to him, and he suggests you disable nebulae. Launch the program, click Settings, then View, then un-check "Nebulae". Yeah, thats it. When i un-check the *Nebulae* than no crashes. I hope SpaceEngenieer can fix this problem, i would like see the Nebulae. Planet with apparently unrealistic moons, maybe a function is needed to limit the moon generated from getting too close to something else. This is already a known issue and it's listed in the known issues list in the post at the top of each page. Read it before posting, please. Added: It has also already been fixed for the next release. 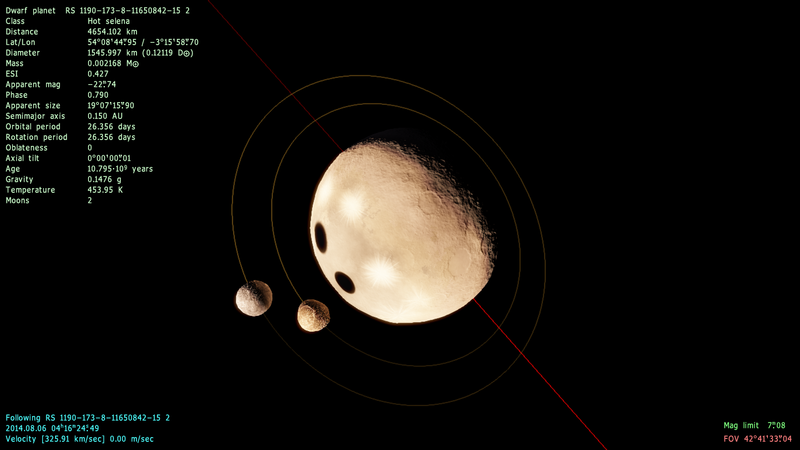 "Dwarf moons can be generated on colliding orbits"? Well, I think that's two problems, the moons are too close to each other and the moons are too close to parent planets. Long time Space Engine user, first time on the forum. So I got the newest version awhile back, since then I have got a slightly more modern graphics card and doubled my RAM. Have an AMD 6670 with 1 gig Vram, quad-core phenom and 8 gigs ram. Hardware was never a problem for me in the past with the last version. So my problem is strange and I have tweaked every setting imaginable. All the planets have transparent surfaces, I can see the star fields right through them. The surfaces are defined they are just transparent. This includes oceans. The transparency is very noticeable at distance and even when landed. Anybody else encountered this? Can't seem to find any threads relating to it. none, you should have posted in the troubleshooting thread. Make sure that HDR for Deep Space Objects is on.